Most of London woke to a light dusting of snow this past Sunday morning but while there are Narnia like scenes outside, we’ve got a bit of the Mediterranean inside. We’ve still got a handful of so of tomatoes grown in our garden and harvested last autumn. Now what kind of tomato keeps for months like that?! Hanging tomatoes do – let’s ignore the fact that I haven’t actually hung mine. These thick skinned tomatoes are the kind to use for the famous Catalan pa amb tomàquet (literally ‘bread with tomato’) and are generally not available outside Spain, maybe not even outside Catalonia. 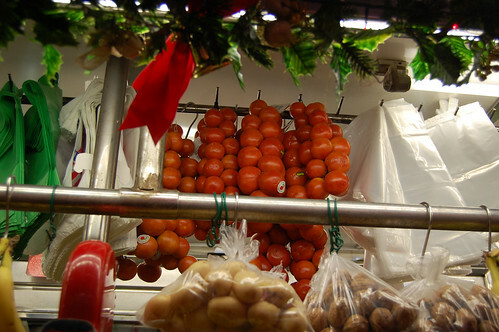 In Catalan, these go by the names tomàquets de penjar (hanging tomatoes) or tomacons. Have you tried making pa amb tomàquet at home with regular tomatoes? There’s not much to squish out of those fleshy salad tomatoes, is there? 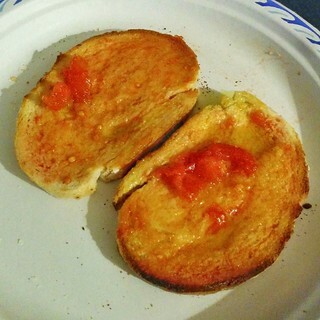 Many Spanish restaurants here, either unable to get the original tomatoes or who need to make lots in advance, tend to puree tomatoes and premix the puree with olive oil and salt and when it’s time to serve, brush this mixture onto toast. It really doesn’t taste the same. These tomacons have lots of liquid and seeds inside their thick skins, making them absolutely rubbish for eating like a salad tomato but perfect for rubbing onto bread. Cut them in half around their equator, and rub their flesh vigorously onto a slice of gently toasted bread. 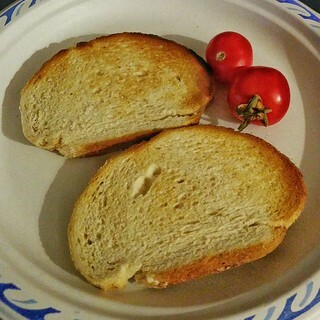 You’ll find the tomato flesh give and release itself all over the bread, leaving empty skins between your fingers. Drizzle with olive and a bit of salt (and you could also rub a little garlic on the toast before the tomato) and you’re feasting. Here’s a photo of another variety in a market in Barcelona. Oh look, they’re being properly hung for storage! You’ll notice that they look a little different than the ones I grew. 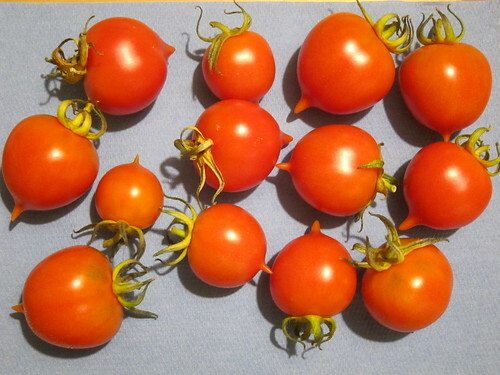 Ours were tomacons of the variety mallorquí, which are quite distinct with their pointy bottoms. I’m growing a different variety next year – Domingo. If you’re looking for seeds to grow them, you can, of course, get them in garden shops in Catalonia but I’ve also found them at Real Seeds – they’re listed as the variety De Colgar (Spanish for ‘hanging’). Ignore what they say about them being nearly extinct as that may be the case in the rest of Spain but it’s definitely not the case in Catalonia; you can buy them from pretty much any grocers. I believe those are the correct seeds! hmm, haven’t heard of these types of tomatoes but will look for them (since I live in Cali), the toast rubbed with tomato sounds awesome!